The Hot Dog Truck: To Lease or Buy a Car? To Lease or Buy a Car? This is one sweet ride! 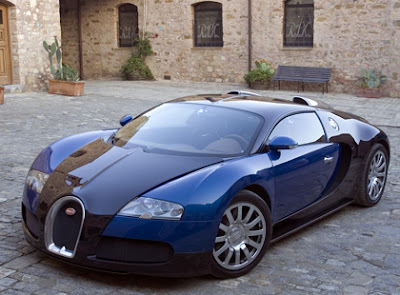 It's a Bugatti Veyron, a sports car made by Volkswagon and named after French LeMans racing Champ Pierre Veyron. This baby has a top speed of 252 miles per hour and is quite possibly the finest sports car in the world. At a $1.7 million base price, it is most likely out of range for most people! Even with far lesser priced cars, many folks want to get into "more car" for their money. A popular way to do this is by leasing your vehicle instead of buying it. Depending on the "spiffs" a new car dealer is offering, you can often get a low payment on a nicer car than if you were to purchase it outright. But how do you know you're getting a better deal? One way is to use the Lease Tool at shrewdlease.com. This free online tool lets you enter all the financial variables related to your vehicle lease and give you a "true cost." You can compare leases on similar vehicles to see where you are getting the best value for your money. The way they do this is they take all the information: down payment, monthly payment, lease term, excess mileage charges, purchase option price at lease end and warranty costs. Their software then calculates a "Shrewd Lease Factor," a number that represents the relative value of one lease over another. The higher the Shrewd Lease Factor number is, the better deal you are getting on your lease. Going into a car dealer armed with this information should help consumers get their best deal. Nobody EVER wants to over pay for a new car, whether they're buying or leasing and sometimes dealers can confuse customers with numbers and what my brother the accountant likes to call "salesman math." When you have a clear understanding of what your total costs are, you're less likely to get bamboozled by some fast talker who just wants you to sign on the dotted line. You can also get a better grip on your budget for your car payments. Sometimes, just paying a few dollars more per month can save you thousands over the lease term. If you are thinking of buying or leasing a new car, it would be a good idea to spend a few minutes calculating your costs with the Lease Tool. You only have your own money to gain!